1 ea. VIS-KIT-01 Open-Sight™ 27 pc work holding clamp kit containing non-marring hold downs, stops and stand-offs. 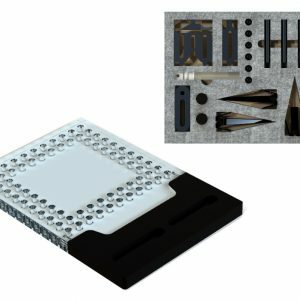 Open-Sight™ 6″ docking rail, a 6×6″ Open-Sight™ fixture plate, and a 27 piece work holding kit. 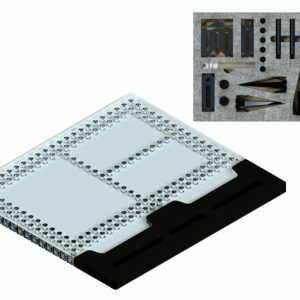 The Open-Sight™ Vision work holding kit includes 2 ea. low profile Spring-Loc™, Sliding Stop™, , Trigger-Finger™ and Trigger-Point™ with shafts, hole adjusters; Simple-Stop™ (#01-OS, #06, #07) and 1 clear adjustable platform. Thumb and button head screws, hex key included. (1) VIS-KIT-01 Open-Sight™ 27 pc work holding clamp kit containing non-marring hold downs, stops and stand-offs. Open-Sight™ 12″ docking rail, a 12×8″ Open-Sight™ fixture plate, and a 27 piece work holding kit. The work holding kit includes 2 ea. low profile Spring-Loc™, Sliding Stop™, Trigger-Finger™ and Trigger-Point™ with shafts, hole adjusters, 3 Simple-Stop™ rails (#01-OS, #06, #07) and 1 clear adjustable platform. Thumb and button head screws, hex key included.